Your bug out bag will be your go-to emergency bag that is designed to allow you to grab-and-go so you can get out of emergency situations and survive with nothing else except for what is in your bag for at least 72 hours. You can plan your bug out bag to help you sustain for longer than that but there is always a limit to what you might be able to carry on your back. A lot of the basic items in the bug out bag correspond to what psychologist Abraham Maslow proposed in the Maslow hierarchy of needs. These parallel items being food, water, clothing and safety. Although historians don’t know Maslow to be a survivalist or a frequent reader of our survivalist blog, we do know he was before his time in acknowledging basic human needs. For your ideal bug out bag, our task will be to help you do the same. The following items are what you should consider packing into your bug out bag to help you get by with the most basic of human survival needs. Water, like food, is one of the most basic survival commodities. If you are assuming that your bag will cover you for three days, you should have at least three liters of water in your bag. You have to think that you might be on the move during your bug out so hydration will be key. A good water purification system will also be important beyond the first three days. You can boil water to purify it or you can pick up some iodine tablets as well as a water filter at your local outdoor store. Surviving for a few days on the food you pack in your bag can be challenging. That is why it is recommended that you invest in some backpack meals and energy bars. Backpack meals just require some boiling water and provide an adequate amount of nutrients and carbs to help you get along. In addition, they are light weight and don’t take up a ton of space in your bag. What you wear can also have an impact on the quality of your expedition. What you pack will depend on where you live. If you live in colder climates you should pack accordingly. If not, you do not really need long johns or gloves. A good pair of boots is always a plus, as are a few pairs of socks, a couple of shirts, underwear and a hat to protect you from the sun. Safety items can be interpreted as injury prevention or reaction and protection. For injuries, a first aid kit is a must. The contents of a first aid kit are deserving of their own survival blog post, and it’s a good thing for you that we covered the Survivalist First-Aid Kit already. What about self-protection? If you are in a true SHTF situation, you might be living in a time where there are no rules. Being armed with some type of protection will be your best defense against the unknown. For this aspect of your bag, a handgun is recommended (check out our online gun store), as is a survival knife. Beyond the basics of food, water, and safety, there is also some basic gear that will make your bag good to go. Fire– There are a lot of ways to make a fire and you just need to know one. Get yourself some good waterproof matches as well as a lighter as you may be spending some nights out on the town. Cookware– As you may need something to purify your water in as well as to cook your backpack meals in, a small pot that you can place over the fire will be key to your ability to eat and drink. Lights– Flashlights and batteries will prove useful at night. Knife– We mentioned this already but a knife is not just for safety, you will most likely be using it for food, building shelter, or a dozen of other factors where a good survival knife is needed. 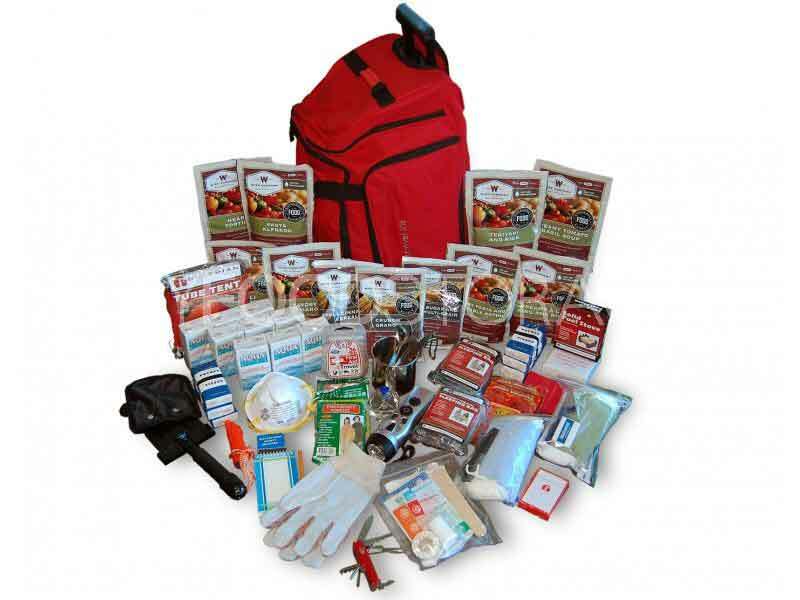 As you can see, the items in your bug out bag can go on and on. This is why we dubbed this a “basic” list. As you learn more about what your survival means to you and the challenges you may be faced with you will have a better idea of what items you really need. The following items are what you should consider packing into your bug out bag to help you get by with the most basic of accessories.